This simply is a road through the Wicklow Mountains, which is still in use for mainly tourist traffic, built at the beginning of the 19th Century to open up the mountains to the English Military to assist them in putting down the insurgents who were the remnant of the 1798 uprising. It passed through Laragh on its way. But the construction of this road was not a simple matter so long ago and it is interesting to hear of the extent of the road, who engineered it and how long it took to make and what it cost in the money of the day. Construction commenced on 12th August 1800 and was completed in about October 1809. The road started in Rathfarnham in County Dublin, passed the head of Glencree, with a spur down that valley to Enniskerry, dipped down Laragh through the Glendasan Valley, over the hills into Glenmalure, and finishing at Aughavannagh. Sections well known would also include Featherbed Mountain, the section below Kippure Mountain, and Sally Gap. The total distance was 34 Irish Miles, of which the spur to Enniskerry was 5 Irish Miles. For those who are too young to have learned about this measure I must tell you that the Irish Mile was 2240 yards in length, compared with the English one of 1760 yards, therefore the length in English measure was 43 miles (the Irish Mile ceased to have legality on 5th January 1826). T he engineer in charge was one Alexander Taylor who was responsible for many other roads in the country, some of them in those days being "Turnpike Roads", that is Toll Roads. He was born in 1746, and therefore was 54 when the work on this road started and 63 when it finished. In one letter written in 1809 at the age of 63 he complained of his rheumatism, and those of us who have experience of the climate to be expected in the barren areas traversed by the roadworks that he directed would understand fully where that originated! I imagine that his work force may have had similar complaint! The route of the road intersected existing roads at Laragh, Glenmalure, and Aughavannagh, and it would seem therefore to have been a good idea to divide the road into sections between these access points and work on more than one section at once, and therefore speed up the construction. But even in those days, and even with the all-powerful English system and their undoubted keenness to rout out the rebels, budgetary considerations dictated that the road be tackled on only one front, and therefore becoming a longer drawn out operation. Of course the surface of the road was bad given the technology of the day, and would be compared to what the engineer of not so long ago would have understood as water-bound macadam. It was still to that standard in the 1950s. It has since been improved with bitumen-bound macadam. Its alignment is mainly as it was made, unaltered. The modern traveller will agree that it does not encourage any speed! The cost of the construction totalled £43,587, which is about £1,000 per English (Statute) Mile. As described above the standard of the road was not up to today's, but it must have been adequate for troops, horses and cannon, and considering the wildness of the terrain that had to be negotiated by manpower and materials during its construction it seems to have been a bargain. At the same time, if the cost were translated to today's money it would likely tell a different story. One very telling piece of evidence that the road was made for the soldiery is the existence of barracks along the route. 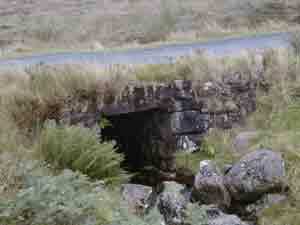 Glencree is famous, and in middling repair, although it is classified as dangerous to enter. It is nowadays beside the Glencree Reconciliation Centre, a most appropriate change from a military use. Laragh Barracks was altered to a residence and is now Laragh Castle. Drumgoff Barracks in Glenmalure is thoroughly ruined. Aughavannagh Barracks is intact, has been used for many years by An Óige as a Hostel, but is now vacant because much work is needed on it to get it in reasonable repair. None of these barracks was started before 1803 and seem to have outlived their original use quite quickly, as there is record that in 1822 each of the barracks was in the care of only one resident Sergeant and that Drumgoff Barracks was sold to miners in the 1830s.